In his July 2012 report, "Collaborative Advice: Using Digital Touchpoints To Enhance Advisor-Client Relationships," Forrester Vice President Bill Doyle shared data about affluent investors' digital interactions with advisors. The study demonstrated a strong correlation between the number of times these investors interact with financial advisors in social networks and the investors' payments for advisors' services. The correlation between advisor payments and the number of social media interactions (0.461) was almost twice as strong as the correlation with the number of interactions in person (0.234) or by phone (0.246). It is important to point out that correlation is not causation. Doyle's data does not suggest that social media interactions are twice as powerful as in-person or phone interactions but that frequent interactions between affluent investors and advisors in social media are associated with greater revenue for advisors. While an advisor can interact with just one client at a time on the phone or in person, social media provides a way for advisors to reach and interact with many clients simultaneously. 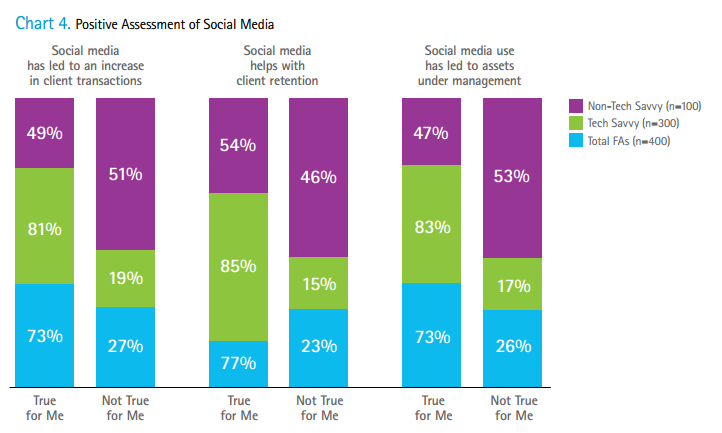 This study demonstrates the power of social media scale and social network relationships to financial professionals. Last Fall, Accenture surveyed 400 U.S. Financial Advisors and published "Closing the Gap: How Tech-Savvy Advisors Can Regain Investor Trust." The research found that digital and social tools "offer Financial Advisors unprecedented opportunities for more frequent interactions with their clients, helping them forge deeper, stronger relationships." In its 2012 survey of 476 investment professionals (including both buy-side investors and sell-side analysts), Brunswick Group found considerable adoption of social media compared to its earlier 2010 survey. More importantly, the study found that investors are using social media to drive investment recommendations and research. 52% read business information postings on blogs (up from 47% in 2010) and 24% have made an investment decision or recommendation after initially sourcing information from blogs. 30% read business information postings on micro-blog services (up from 11% in 2010); 12% of investors have made an investment decision or recommendation after sourcing information from micro-blog services (an increase of 200% since 2010). 24% read business information postings on social networks (up from 17% in 2010), and 9% have made an investment decision or recommendation after initially sourcing info from a social network. Investment professionals are increasingly posting and not just consuming information in social channels. In 2012, 11% said they post investment information to blogs (more than doubling since 2009), 8% post investment info to microblogs (up 50% since 2010) and 10% post investment information to social networks (doubling since 2010). Overall, 56% of investment professionals say the role of digital and social media in the investment decision process is increasing compared to 6% who felt it was decreasing. Even for high net worth individuals with more than $1 million in investable assets, 25% seek investment advice from social media. While many firms are proceeding slowly and cautiously into social media, it seems many of our licensed financial professionals and our wealthy customers are adopting social media with more haste. In fact, the Accenture report notes that so many financial advisors are using social media that many are "likely flouting their firms’ current policies against this type of activity." Forget keeping up with the competition. Financial Service firms ought to worry more about keeping up with their own sales networks, employees and customers.